The Air Hogs RC Helix X4 Stunt is a high-performance RC stunt quad-copter! 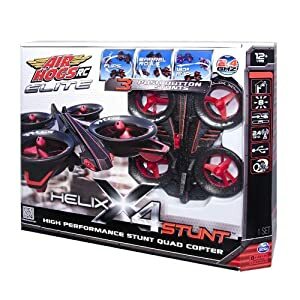 Utilizing 2.4GHz radio control, gyro stabilization, and 4-ducted fans, the Helix X4 Stunt is aggressively maneuverable and incredibly fast! Perform 3 incredible stunts with the push of a button as you backflip, barrel roll and 180 flip. The Helix X4 Stunt features incredibly crash-resistant materials protecting the rotors and delivering superior durability. Its full 4-channel control enables the Helix X4 to easily outfly any obstacle and out stunt any other RC vehicle. Nothing moves like a Helix! Experience the future of flight with the agile Helix X4 Stunt! The Helix X4 Stunt is a high-performance, easy-to-fly Quad Copter that delivers an unbeatable flight experience! The Helix X4 Stunt performs insane backflips, barrel rolls and 180 flips with the push of a button! 4-ducted fans and on board gyroscopic stabilization maintain flight stability delivering top quality control. The remote control uses 2.4Ghz communication, increasing the strength and distance of the control?s signal. 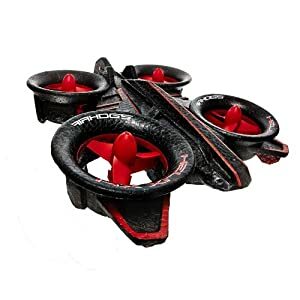 I have used Air Hogs Helicopters in the past with my daughter and have to say that those were a lot more difficult to master in my opinion than this was, and you get to do some very cool tricks with this. 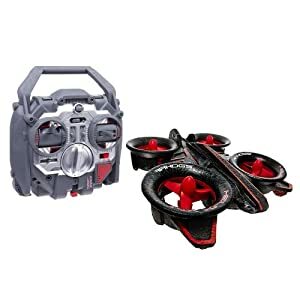 I loved the unique design on this and the ability that you have to use the 4 fans to hover and do tricks. What was nice with this was that you can really get some height with this, do flips and really have good handling control. Don't get me wrong, it still takes some practice to get it down, but I found it to be much easier to use than the last air hogs product that I used. Like some of the other air hogs products that I have used in the past the design of this allows you to charge it easy and you get maybe a good 10 minutes at best on a full charge (that has been what we have received at least)...it is enough though to have fun with it and then recharge. All-in-all we had a blast with this and you will too!